Monster Beverage should report on, and if necessary reduce, its exposure to slavery and human trafficking in its sugarcane supply chain. An estimated 40 million people are victims of modern slavery, with 24.9 million in forced labor. These victims work in virtually every industry and across sectors in a company’s supply chain. According to the U.N. Guiding Principles, companies have a corporate responsibility to respect human rights within their operations and supply chains. The issue is seen as a material risk for shareholders due to potential litigation and loss of revenue by brand association with slavery. The October 2016, Know the Chain, Food & Beverage Benchmark Findings Report scored Monster at zero (0), stating, “Monster Beverage Corporation places last on the benchmark, underperforming across all thematic areas relative to its peers.” This reflects poor transparency and disclosure in managing human trafficking and forced labor risks in its supply chain. In contrast, Coca-Cola, Nestlé, and Pepsico, scored 58, 57, and 45 respectively. While Monster has since published its forced labor policies on its website, it still does not report risk analysis and monitoring metrics down to the commodity level consistent with its peers. Monster also does not report on Supply Chain Transparency or Monitoring and Certification. Peers including Coca-Cola, a major Monster shareholder, discloses a map highlighting countries of origin. Others disclose names and addresses of sugar suppliers. 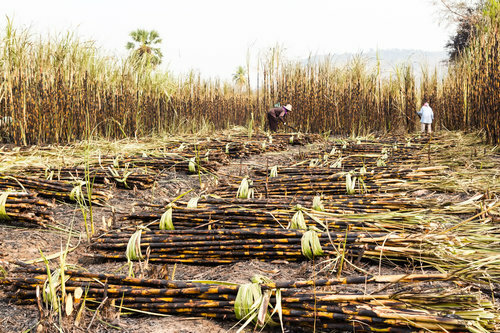 Many of Monster’s peers disclose how they monitor sugarcane field working conditions. Monster states that it does not conduct unannounced supplier compliance audits because of assumed minimal risk of slavery and human trafficking, yet there is no detail of how this was determined, beyond simple assurances by suppliers of compliance with the law. As shareholders, we lack confidence in Monster’s conclusion that it is exposed to minimal risk of slavery and trafficking based on the limited information provided and the number of sugar production countries where forced and child labor is known to exist.